Leonardo Bonucci's suggestion that Juventus team-mate Moise Kean was partly to blame for the racist abuse he received from Cagliari fans is laughable, says Manchester City winger Raheem Sterling. Kean, 19, spread his arms while facing the crowd after scoring Juve's second goal in Tuesday's Serie A win. Bonucci said Kean "could have done it differently" and "the blame is 50-50". England international Sterling, 24, said: "All you can do now is laugh." Italy defender Bonucci, 31, responded by writing: "Regardless of everything, in any case... NO TO RACISM." Following the game, Bonucci told Sky Sport Italia: "Kean knows that when he scores a goal, he has to focus on celebrating with his team-mates. He knows he could've done something differently too. "There were racist jeers after the goal. Blaise (Matuidi) heard it and was angered. I think the blame is 50-50, because Moise shouldn't have done that and the Curva (fans) should not have reacted that way. "We are professionals. We have to set the example and not provoke anyone." Later on Wednesday, 24 hours after the match, Bonucci aimed to "clarify" his comments in an Instagram post and said his "words have been clearly misunderstood". "I firmly condemn all forms of racism and discrimination," he added. Italy and Juventus captain Giorgio Chiellini defended Kean's actions, saying he had watched the incident again after the match and concluded his young team-mate "did nothing". "Moise is a legacy of Italian football, a golden boy, who is doing his best and should not have to pretend for what he is not," Chiellini, 34, said. Kean posted a picture of his celebration on Instagram after the game with the caption: "The best way to respond to racism." 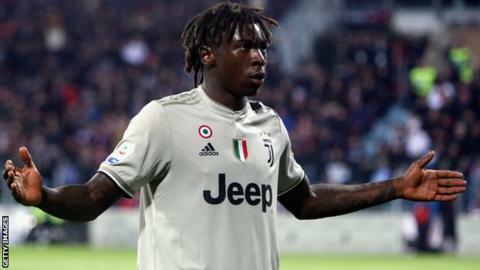 Kean's agent, Mino Raiola, told BBC Sport that anyone at Juventus not willing to fight racism should leave the club. "Nobody should justify racism in any way or form," he said. "Racism is equal as ignorance. There is no excuse for it. Federation, clubs and players should draw one line. "A country like Italy should be leading on this given how many millions of Italians live abroad. You cannot be racist and Italian. You cannot be human and racist." Bonucci saying Kean had to take a share of the blame was the "worst scenario" for a player who had suffered racist abuse, according to former Manchester City midfielder Yaya Toure. "Having your team-mate attacking and saying things like that is unbelievable. It was totally disrespectful," Toure said. "When this kind of situation happens people of course look to the black players but I feel Bonucci needs to be a bit cleverer and smarter than that." Juventus midfielder Matuidi tweeted a photo of the celebration in support of Kean, while Manchester United and former Juventus midfielder Paul Pogba said: "I support every fight against racism, we're all equal." He added in Italian: "Good Italians wake up, you can't let a small racist group speak for you." Another ex-Juventus player, Patrice Evra, said the abuse was "not acceptable in football or anywhere in the world". "Well done to Moise Kean for standing up to them and showing them who is boss," he tweeted. "The world would be a better place if we all shared more love no matter what." Juventus women's forward Eniola Aluko, who has 102 England caps, said: "I choose to support my Juve counterpart not blame him. "The good news is the ignorant idiots of Cagliari are going absolutely nowhere in life, whilst Kean is a rising superstar and Matuidi a World Cup winner. I also focus on that." Italy striker Mario Balotelli shared a picture of Kean with Matuidi and wrote: "Although we are divided and different in our destiny, nothing else has to divide us. I condemn racism in any form and place for EVER." Crystal Palace and Belgium striker Christian Benteke said: "What happened to Moise Kean last night is inexcusable. "Two incidents recently have highlighted even more that there is still a shocking issue within our beautiful game. "I have nothing but respect for what Moise and Raheem did and how they handled the matter." "This is the third year in a row that black players have been racially abused at Cagliari - Blaise Matuidi and Sulley Muntari have faced the same treatment, and yet the Italian FA allows it to continue," Kick It Out said in a statement. "Ultimately Uefa, national football associations and referees cannot do the job of protecting players from racial abuse. There can be no complaints if they begin to take the situation into their own hands." Cristina Blasetti from the Italian Football Federation, also speaking at the Equal Game conference at Wembley, said: "We are very sorry for what happened last night. We are doing our best to tackle this issue." On Tuesday, Uefa president Aleksander Ceferin asked referees to be "brave" and stop matches if there was abuse from "loud, aggressive and primitive" people.